With charming style and comfort, the diamond pattern Lexington park bench enriches outdoor atmospheres. Popular for a variety of installations from intimate patio settings to expansive public seating areas, the sturdy cast aluminum frames utilize footings that are designed to allow for both portable and surface mount capabilities. The durable 1-1/2" cast aluminum frame features built-in comfort armrests and provides superior bolt-on support of the bench seat assembly. 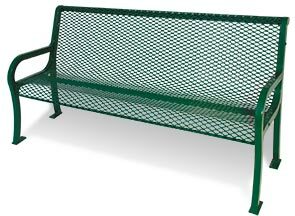 Available in 4' and 6' lengths the contoured one-piece seat assembly is constructed utilizing commercial grade 3/4" #9 expanded steel, widely known as the diamond pattern design. Ready for all-season use and engineered to maintain its fresh look throughout, these park benches are finished in a weatherproof thermoplastic coating with UV-stability. The finish provides ultra-durable corrosion resistance and is available in the color options as shown.